I’ve tiered up! Which means I’m now paying (I think it is) US$40/month to Linden Lab, and I can now own up to (I think it is) 512+8192 square meters of land, rather than the 512+4096 that I had before. The first thing I bought in expanding my empire was 512 m2 in the Duchy of Darkmere, where many of the neighbors are fellow participants in the interestingly twisted Second Citizen II forums. The trees and platform and “Welcome” sign are all mine. The whatever-that-is in the background isn’t. This is right on a Linden road (just visible, lower-right), which is fun, as I can sit and watch the carts rumbling by on their way to market and whatnot. Then I looked around Hughes Rise, where my park is, and found very little for sale. One tiny (48m2 I think it was) and wildly overpriced plot that I guess someone is hoping someone will buy just to host a server prim or something, and one slightly overpriced 512 diagonally touching the current Park land. I bought the latter, despite it’s being slightly overpriced. That was day before yesterday. Then yesterday I looked around the Rise again, and found a very nice flat 1088 near the edge of the sim, reasonably cheap. After I snapped it up, I discovered that (A) it’s right on the Linden road that goes through the corner of the sim, and (B) sometime since my last roadtrip, that road has been paved! Well, cobbled. And it’s had bridges built, and decorative stones and trees and rez zones installed along it, and it’s named “Wellington Road”, and all sorts of good stuff. The road and bridge in the foreground are Linden-owned and Mole-wrought, as is the leftmost tree. The other trees, the sitting area, and the Welcome sign are all mine, as is the little toy car you can barely see among the tree branches to the right, and the slightly npirl light-beam streetlamps (more visible in the larger size). I have great plans for that little toy car :) but for the moment it is just sitting there unscripted. So, like everyone, I am sorry for the many Lindens laid off the other day, and I don’t think it’s a wonderful sign for SL or VWs in general. 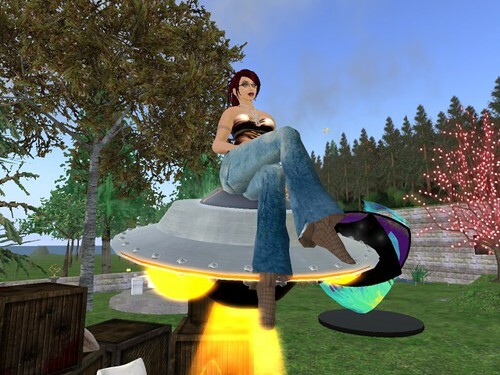 But on the other hand I don’t think it’s The End of SL, and certainly not The End of Virtual Worlds. I think, most likely, the Lab just hired on the expectation of continued exponential growth, and when that didn’t happen they found they were paying far too many people. 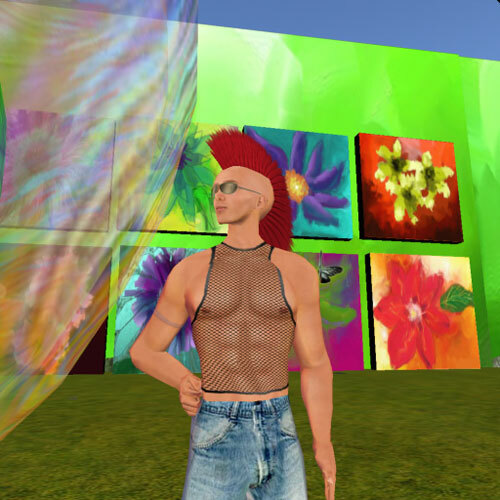 And if SL were to close down (or become a Flash app on Facebook, which would amount to the same thing), I would still be convinced that virtual worlds are a pretty important Next Big Thing, and I would be hanging around Inworldz, or Reaction Grid, or (most likely) some nice interoperable cloud of same. 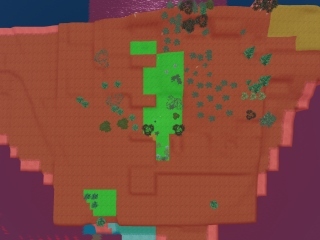 So v good friend Chestnut put up a weblog entry about her an’ Zha’s new mainland land, and I thought I’d pop over and look at it, being a big mainland fan myself. 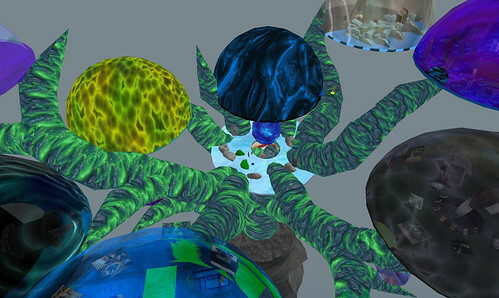 I’d heard somewhere that it was now possible to get from the southern continent (Jeogeot, where my Hughes Rise park is) to the northern continent (Sansara, the original core of Second Life, where’s Ches an’ Zha’s new place is). So having a few minutes free in the middle of the day, I thought I’d give it a shot. To start the jaunt, I went overland on the Rise, up to the Linden protected-land right-of-way in the northwest corner (parcel 01 on my map from the other day). Here I am on the right-of-way, passing by Sadie’s Dyke Bar. There’s a nice long strip of Linden protected land cutting SW to NE through this part of the continent; maybe the Moles will put in an actual road! Continuing roughly northeast along the right-of-way, here I am passing over a racetrack or… something in Bulgogi. I was in a bit of a hurry, so couldn’t stop to look at all of the interesting things (or even wait for them to finish rezzing completely). Here’s a nicely-designed office park or something in Muk, with the moon shining over the ocean visible between its levels. There were various hot-air balloons drifting majestically about in this area, between the Rise and the northern tip of Jeogeot. 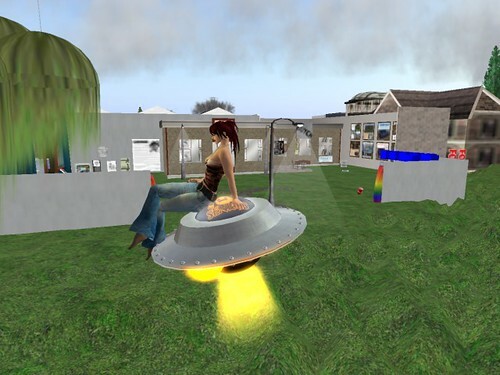 I got off my saucer and floated briefly around on one. It was relaxing. Here I’m passing over some construction sites (or possibly buildings that haven’t finished rezzing!) in a vaguely urban area. Shortly after this, back on my saucer, I happened to notice a familiar-looking parcel name go by in the parcel-name bar, and looking down I saw that I was flying over a friend’s house, where I’d been visiting just the other day! I didn’t take a picture of that because, I dunno, I guess because it’s a friend’s house :) but these coincidences are always fun. Huge as the grid is, it’s still a small world. At the northernmost tip* of Jeogeot, I came to a nice beach area with inlets and rocks and dunes and cattails and poseballs. Here I am gazing northward, out to sea, talking with a woman who was out there sorting inventory. I scrolled around on the map enough to convince me that there is in fact no navigable bridge between Jeogeot and Sansara (it’s a long distance! ), or at least none I was going to find that day. Time was getting very short, so I said bye to my flattering new acquaintance, and teleported directly off to Marawa. Having done some part of what I intended, I TPd home and put the flying saucer away, and relaxed in my giant chocolate donut to get back to RL. There’s no place like home! Although yeah the Rise is not strictly speaking home; that’s Extropia. But the Rise is my mainland home, and I love it there! It’s been suggested that I haven’t posted much in my weblog lately. Without admitting any wrongdoing, here I am posting to my weblog, in the form of some pictures with text describing them, about some stuff I’ve been doing. 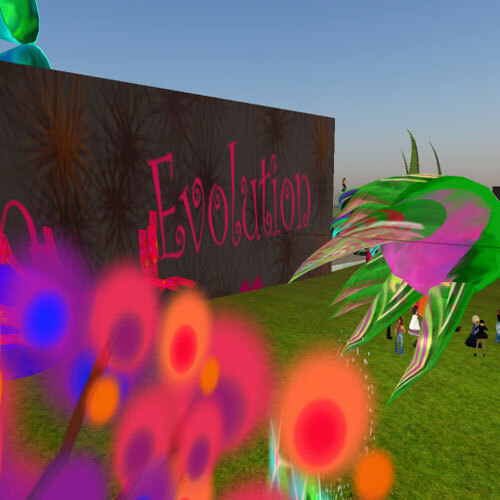 Here I am, still in that hair (recolored to my favorite darkish red), at the opening of the Evolution Gallery. Congrats to Sabrinaa Nightfire and Alan801 Eclipse for a great opening event! This was like two and a half weeks ago :) but I expect the show is probably still going on if you want to stop by (and you should!). I ran into Botgirl Questi at the opening, which was fun. 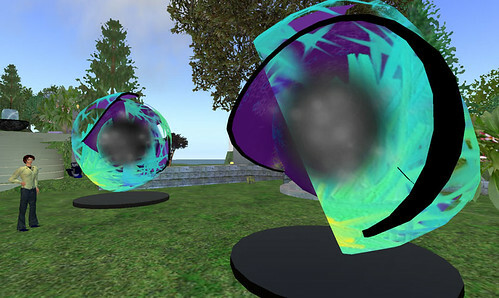 She was/is on hiatus from her usual full-on content creation, and seemed to be enjoying being inworld to just wander around. And speaking of art, here’s a snapshot of the new back garden of the Hughes Rise Park (I think I’ve moved some stuff around since then, but it’s still basically the same). 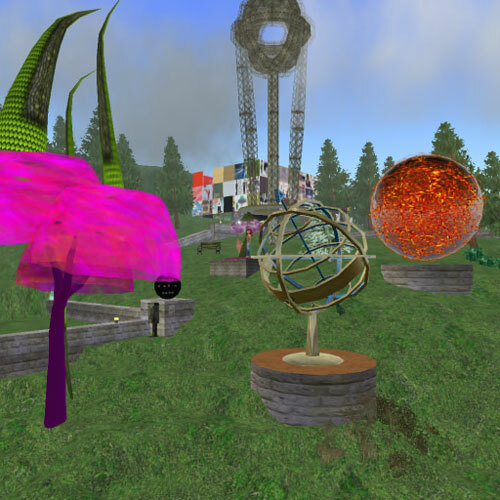 The pink tree with green waving tentacles at left is from the aforementioned Sabrinaa Nightfire; to the right of that is a lovely armillary sphere by Honour McMillan (which she gave me in return for some time-related scripting). The orange fireball to the right of that is elros Tuominen’s "A kind of fireball I am building", on loan from Honour’s own collection. Nearly invisible in the center, there’s me standing by a lovely meditation station that was a holiday gift from Chestnut Rau. (I never did do a posting about all the cool stuff that arrived over Solstice, did I?) And in the background looming over everything (including the junkshop next door) is an Aetheric Flux Storage Tower (v2) by CoyoteAngel Dimsum, which I vaguely recall having found sitting around free-to-copy in Caledon or somewhere once. It’s large! 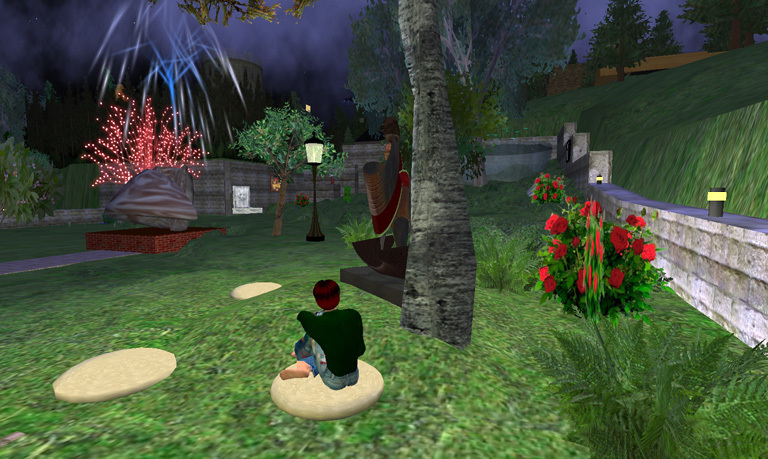 More recently I went to the opening of Phinn Boffin‘s “Changing Hues” show at Second Arts; it was a great time. (That’s me on slide 24; I can’t figure out how to link right to it.) I bought a framed copy of the gorgeous Maria Maria (and one of the more, erm, scantily-clad ones). The other week I met SL artist Sabrinaa Nightfire while she was working on the Identity Circus with Botgirl Questi. We got on very well, and did the usual fun artist stuff of showing each other our favorite pieces and all (she’s got the coolest house!). We were talking in IM the other day and I mentioned that I had a sore throat (and I still do, although it’s slowly slowly going away). A little while later I got some blue dropdowns informing me that she’d sent me a couple of objects called “Throat Lozenge”. They turned out to be a little large to swallow :) but they look good sitting as a temporary installation in the Hughes Rise Park. They have been our fathers, and our mothers. It was many generations, before we came here. Thousands of years after they dissapeared. We want to know, what happened to them. May be, it was war, or disease, a catatsrophe or they just left the galaxy. They could imagine things, befor they actually existed. They called it Science Fiction. And we think,the answer to the question what happened to them, can be found in their Science Fiction. It was one of those great times when you gather some friends who don’t already know each other, and they all get along fabulously. We sat around talking about nothing and playing with the toys (a hangman, a flying vehicle rezzer, meditation and sitting and swooning poseballs, etc), getting to know each other. I’m sure at least a few new friendings resulted. Yay us! And apologies to anyone who was around but didn’t get a TP; at seven or so folks we sort of ran out of places to sit, and I didn’t make any concerted effort to invite folks; it was all just random happening by. I won’t identify the lovely ladies above, just in case they don’t want to be named as sitting around on rocks in their dainties. :) But they should feel free to identify themselves in comments if they feel moved to. Click through to the flickr page for, well, another copy of exactly the same words above. Hee hee! Here is a picture that I put up on Flickr. It’s set in Second Life! Whoa. That’s boy-me, sitting in my then-new (still new, really) park in Hughes Rise. Click through to the Flickr page for details.